expressor software has introduced expressor Studio and made the beta version immediately available as a free download. expressor Studio provides game-changing ease-of-use with a drag-and-drop and wizard-driven interface that enables developers to easily connect to standard data source and targets, map data to common business names and types and design complex data flow applications in minutes. The expressor Studio beta is available immediately as a free download from http://www.expressorStudio.com , and the general release version will be available as a free download by end of year. Users will be able to access online support from expressor software and from their peers by visiting http://www.expressorCommunity.com and logging into the new expressor Community Center, a vibrant online community. expressor Studio is a high-reward, low-risk option that allows organizations to immediately get started and benefit from semantic data integration, said expressors vice president of marketing Michael Waclawiczek. With expressor Studio, we deliver enterprise-class ETL onto your desktop that benefits from a familiar Microsoft Office-like look-and-feel and a fast embedded engine to create and run reusable data mappings in minutes. 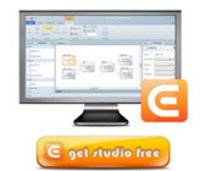 And most importantly, expressor Studio can be downloaded for freewith no strings attached. Easily rationalize source and target field names to improve communication and data governance. Automate data-type conversions and eliminate errors. Build new Semantic Types from existing types and reuse types in existing and new applications. Create multiple reusable business rules for the same type and debug rules once and apply them repeatedly. Easily implement data quality rules and constraints. Check the validity of a data flow application before deploying. Ive seen expressor Studio and like the fact that the company now offers a free, downloadable product with lots of cool capabilities, said Andy Leonard, SQL Server MVP and SSIS guru. The graphical, color-coded user interface of expressor Studio all but eliminates the need for training by guiding you through each step of developing an expressor ETL job, said Scott Morgan, data warehouse architect for H. Lee Moffitt Cancer Center & Research Institute. My one-word description for the new user interface is that it is fantastic. expressor software knows data integrationand we know todays most capable data integration tools are too complex and too expensive. Our vision is to provide enterprise-class data integration software that is cost-effective, fast and easy to use. expressors game-changing usability enables you to use less technical, lower-cost development resources. Our unique, active metadata foundation simplifies data mapping and transformation to reduce your time-to-value. And our dramatically lower cost makes it easy to justify replacing your brittle and expensive hand-coded implementations or underperforming in-house ETL tools. expressor 3.0 is a comprehensive design, development and deployment platform available in three editions tailored to support the full range of data integration applications, from tactical data migrations to the largest enterprise data warehouses and strategic, predictive analytics. To learn more about what makes expressor the leader in affordable, enterprise-class data integration, visit http://www.expressor-software.com or download the free expressor Studio at http://www.expressorStudio.com.